The Ha Ha starts for many boats years before they actually leave their home port. The Conger Family has prepared for the Ha Ha for nearly three years. We always wanted to do this rally "for the kids." Our time in Canada sealed the deal for the adults as well. The Ha Ha is a quick and easy way to meet and greet a lot of cruisers. It's also a fantastic way to connect with other family boats. Our Ha Ha socializing also began well before the event. We met our first Ha Ha bound boat cruising the west coast of Vancouver Island in August. At the time, we were not very diligent about writing stuff down so we promptly forgot their name and boat. It's embarrassing. Emeryville in the Bay Area was a positive haven of Ha Ha boats. It helped that by September, the rally committee had sent out our cruising packages which included a Baja Ha Ha sky blue and white flag. 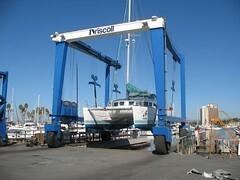 By running this up the spreader, we were able to attract the attention of boats all over the marina. Because we had our good friends s/v Rubber Duckies, Excellent Adventure, and Totem to distract us, we didn't spend much time with Ha Ha'ers in Emeryville. However, ever since, it's been almost a default stance. There was s/v Wish on the dock at KKMI. s/v Vindsong and s/v Sea Horse trapped with us in San Simeon. s/v VictoryCat on the hard here in San Diego. There was s/v Sirius Star -- a father and young daughter team looking for other kid boats -- and at every turn we hear about another family "desperately seeking kids." 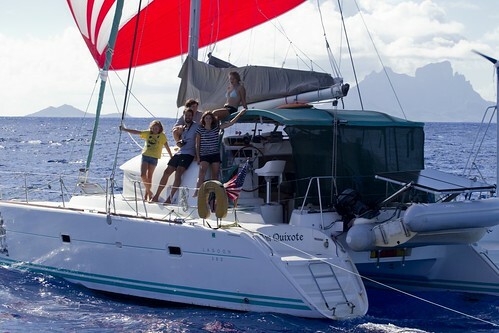 Dinners, movies, drinks, and long chit chats on the VHF quickly become the norm, with those bright blue and white banners waving an introduction from any distance. But what consistently slows down our socialization is work work and more work. Three years of constant effort to make us ready to cross the border was apparently insufficient. We've been in the yard far more than we've been out during the past month. We've spent an obscene amount of money and the yard grime is ground into my heels so badly that I think the only way to restore their original pink color is to slice them off. We are, however, all done with that. I don't know if our alternators will ever work correctly. I think that's an open question. We've now got folks who know what they are talking about saying we should strip the whole thing out and start over with a considerably more simple system. Okay. If that worked, I'd do it. If dancing naked on the beach singing Disney show tunes with a string of Christmas lights draped over my shoulders worked, I would do it. The good news is that everything else is ready to go. So we head out for the Baja Ha Ha with only two things that hover over our boat like Damocles sword: those alternators for whom voodoo is apparently the strongest form of mechanical improvement option available and a complete lack of Mexican currency. The good news on that later is that with the peso plummeting along with the dollar, we don't expect folks to have any trouble taking dollars at our first port until we can get to a Mexican bank. Good bye United States. I'll be back in a few years. Take care of yourself. All I can say is: "Wish we were going too!" Best wishes to you and your crew! Next time I have a margarita, I'll think of you and smile!